There has recently been some debate about whether QE is inflationary, so this thread could be a good place for posting stories reporting price rises (and falls!). I am sure I will find at least one per day from one of the money printing hotspots around the world. Energy firm Npower has become the third major supplier to announce price rises, with a dual-fuel bill to go up 10.4%. The price rise will take effect on 1 December, and is the highest increase announced by any supplier so far. SSE will increase prices by 8.2% from 15 November and British Gas said prices would go up by 9.2% on 23 November. FT Front Page (paywall). Bundesbank calling apartments as 20% overvalued. Values in the U.K. capital surged 10.2 percent, or 50,484 pounds ($82,000) from the previous month, to an average 544,232 pounds, the property-website operator said in a report today. Estate agents in inner London reported a “buying frenzy” reducing the available stock to nearly nothing, it said. New home prices in September rose 20 percent in the southern business hubs of Shenzhen and Guangzhou, 17 percent in Shanghai and 16 percent in Beijing from a year earlier as prices climbed in 69 of the 70 cities the government tracks. Could we see a sudden spike in interest rates on foot of some of this? Even a small jump in interest rates could be catastrophic for people with large mortgages on trackers. No, they will not raise rates until a) it is too late b) they have filled their pockets and left office. Tracker mortgages at low interests are allowing people front load their Capital Payments even though they are making smaller payments. This will give them some breathing space when rates eventually go up. Absolutely true, but I wonder how many have actually used their low interest trackers to front load ? If this bust has shown anything, it’s that people don’t sufficiently plan for the future. If your interest rate comes down, your mortgage payment comes down automatically. You have to tell the bank that you want to keep the same level of payments. It’s a variable rate mortgage (tracked off the ECB rate), not a fixed payment. I know that. I have a tracker. What jake76 is saying is that - even with these reduced payments - you’re still paying off capital earlier than under the original agreement. He’s even given a link and produced numbers to back this up. The point is that under the original agreement, the earlier payments attract a higher percentage of interest (because the interest rate is higher). As you pay it off, the interest rate drops quicker than under the tracker (where the interest rate is low). So over the same 30-year period, a tracker actually eats into the capital quicker. Which means tracker mortgages are being front-loaded. Edit - you can try this out in Excel if you wish. Take a 360-month mortgage for E300k. One is @ 1½% , one is @ 5%. Repayments are E1,035.36 and E1,610.47 respectively. Even though the tracker is paying E580 a month less, by the end of month 12, it’ll have paid off E3,553 more capital than the 5% loan. At the peak, after month 209, the tracker will have paid off E37,826 more capital than the 5% loan. This is the crossover point where the higher payments have finally reduced the loan to the extent that the 5% loan will now pay off more capital than the tracker. It then quickly catches up so that both mortgages are paid off at the same time. The latest volley, from his new book, “The Map and the Territory,” is a warning that the Fed’s balance sheet expansion — $3.8 trillion and counting — may unleash inflation. “It is easy to contemplate price acceleration, with today’s Federal Reserve balances unchanged, ranging from 3 percent per annum to double digits over the next 5 to 10 years,” he writes. It’s been a long time since anyone accurately predicted higher inflation. Instead, inflation has sagged to the lowest levels on record. 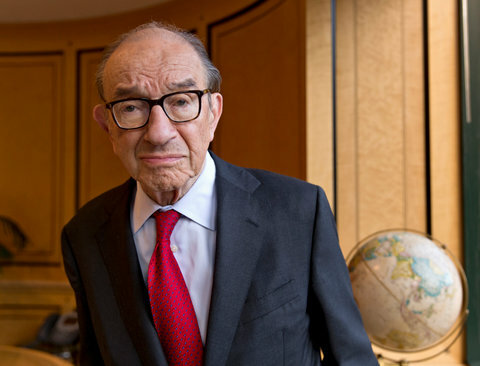 But here’s why Mr. Greenspan is worried. I paid off a 25 year mortgage in 12 years (well, I would have if I hadn’t sold up!) by overpaying and keeping payments constant while interest rates fell. Every time they fell, I had to ring up the bank and say ‘don’t reduce my payment, put the excess in capital’. They do not do this automatically. They automatically reduce your payments. They automatically reduce your payments by the amount the interest rate has fallen (i.e. the reduction in the interest expense). Your capital payment remains the same unless you explicitly say you do not want this to be the case. Okay, I get where you are coming from now, but the thing is that you end up still in the same boat, pretty much, as the difference is going to be small compared to be the difference if you kept payments higher. Compared to if you keep the original payments up, certainly. I agree that people will put the money elsewhere. Though at the rates trackers are at at the moment, I’m not sure it make sense to pay them off early - even allowing for 41%+ DIRT, it probably makes more sense to put money into a deposit to earn interest rather than save on it. Your capital payment remains the same unless you explicitly say you do not want this to be the case. We’ve already seen that this isn’t the case. The term of the loan is what remains constant, not the capital. That’s the whole point of the sums myself and jake76 have done. They automatically reduce your payments by the amount the interest rate has fallen (i.e. the reduction in the interest expense). Your capital payment remains the same unless you explicitly say you do not want this to be the case. 100k mortgage over 25 years @ 1.5% give repayments of €4,791 p.a., €3,326 of this is capital repayment, €1,464 is the interest expense. Just to be technical, that capital/interest split is only the average over the loan.